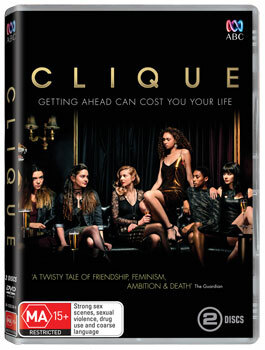 Thanks to ABC here is your chance to win one of 5 x Clique DVDs. Childhood soulmates Georgia (Aisling Franciosi, The Fall) and Holly (newcomer Synnøve Karlsen) are only a few weeks into the so-called best years of their lives at university in Edinburgh, when Georgia is drawn into an elite clique of alpha-girls, led by lecturer Jude McDermid (Louise Brealey, Sherlock). Jude's brand of feminism is alluring and Georgia's effortless entry into her clique leaves Holly out in the cold. But as Georgia's behaviour becomes increasingly erratic, Holly's jealousy turns to panic and she is compelled to follow her friend into Jude's closely guarded circle. What she discovers is a seductive world of lavish parties, populated by Edinburgh's business elite. A world underpinned by sordid compromise, Holly begins to expose its deeply corrupt core as the danger mounts from all angles. Can Holly reclaim her best friend in time before she loses everything? In her television debut, Synnove Karlsen stars alongside Emun Elliott (Prometheus; Game of Thrones; Star Wars: The Force Awakens; Filth), Alistair McDermid. Rachel Hurd-Wood (Peter Pan; Tomorrow, When the War Began; Perfume: The Story of a Murderer), Sophia Brown, Ella-Rae Smith, Emma Appleton Mark Strepan (New Blood), Sorcha Groundsell (Iona), Peter Bankole (The Physician), Chris Fulton (One of Us) and Harris Dickinson (The Medium, Home). Written by Jess Brittain with Kirstie Swain and Milly Thomas, Clique is a seductive, intense drama about friendship tested to extremes. It is an uncensored exploration of how being a young woman can feel today.